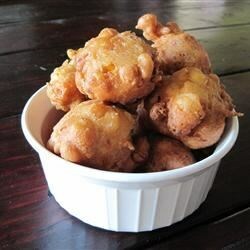 "These deep fried fritters are amazing! They may sound a little different, but they are remarkably easy to make and will take you way down South. Serve with cayenne butter (melted butter with some cayenne added), or with cayenne aioli (mayonnaise with fresh garlic and cayenne pepper in it). Try garnishing with thinly sliced green onions. Enjoy!" In a large heavy pot, preheat the vegetable oil to between 350 degrees F (175 degrees C) and 375 degrees F (190 degrees C). Shuck, wash and dry the corn. Using a sharp knife, shave the ears of corn into a medium sized bowl. Using a cheese grater, scrape any remaining corn and juice into the bowl with the kernels. Discard the scraped cobs. In a mixing bowl, whisk together the eggs and milk. Combine the corn, ham, cayenne pepper, red onion, salt, flour and baking powder with the egg and milk mixture. Whisk until a firm batter has formed. Slowly drop rounded tablespoonfuls of the batter into the hot oil one at a time. The drops should form a loose layer on the top of the oil. Fry until the drops of batter are dark golden brown. Remove the beignets from the oil and place them on a towel. Check that they are cooked all the way through. If the centers are doughy, lower the heat of the oil and fry the beignets again for 2 or 3 minutes. Repeat this step until all the batter has been used. I have not stopped making these since downloading them a month ago! Everybody loves them. I added 3/4 cup cheddar cheese and halved the cayenne pepper after the first batch. Firm favourite now! So so delicious!!!! I followed the recipe exactly but used Canadian bacon instead of ham. Everyone raved about them! I made a Cajun dipping sauce that was the perfect compliment.